Showing items in category Colonial Proofs/Miscellaneous, sorted by newest listed first. 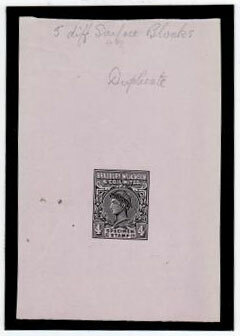 GB and COLONIES - 1924 ungummed BLOCK CYPHER watermark paper. 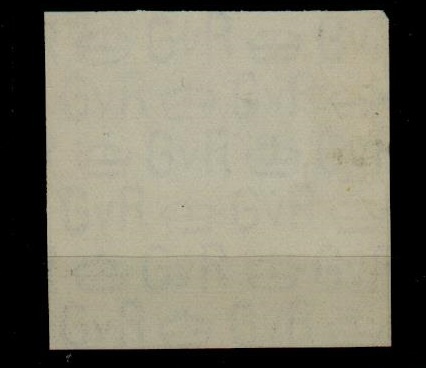 1924 ungummed paper piece (43x43mm) showing the BLOCK CYPHER watermark (SG type 111). Scarce as paper had to be accounted for. Used for GB and its colonies (British Levant, Morooco Agencies etc). COLONIAL PROOFS AND ESSAYS - 1910 £20 black 'Overseas Dominions' IMPERFORATE PLATE PROOF. 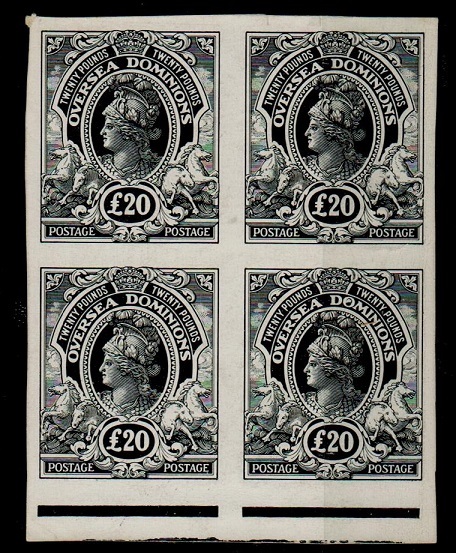 1910 OVERSEAS DOMINIONS £20 black postage/postage IMPERFORATE PLATE PROOF bottom marginal block of four on thin glazed card printed by Waterlow and Sons. Very scarce. COLONIAL PROOFS AND ESSAYS - 1910 £20 red 'Overseas Dominions' IMPERFORATE PLATE PROOF. 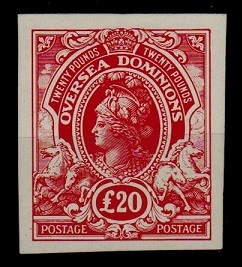 1910 OVERSEAS DOMINIONS £20 red 'Postage/Postage' IMPERFORATE PLATE PROOF on thin glazed card printed by Waterlow and Sons. Very scarce. 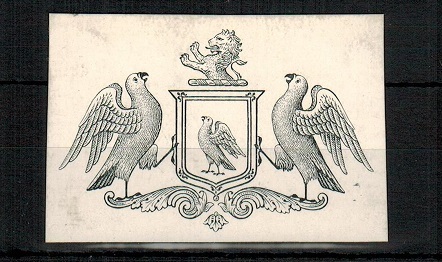 COLONIAL PROOFS - 1930 (circa) 'Bird and Lion' crested proof on thick glazed card. 1930 (circa) stated De La Rue black PROOF of birded crest with lion above printed in black on thick glazed card (52x38mm). The country of origin is unknown but likely to be of a South American country. Unusual. 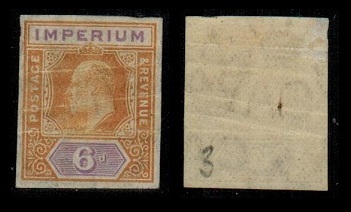 COLONIAL PROOFS - 1902 6d 'Imperium' IMPERFORATE PROOF in orange and violet (faults) but rare. 1902 6d 'Edward VII' IMPERIUM (Postage & Revenue) 'key plate' IMPERFORATE PROOF printed in orange and violet on gummed watermarked paper. The stamp has three horizontal bends running through the adhesive but is a colour combination not often seen. COLONIAL PROOFS AND MISCELLANEOUS - 1935 (circa) 'KGV' IMPERFORATE PLATE PROOF of head in green. 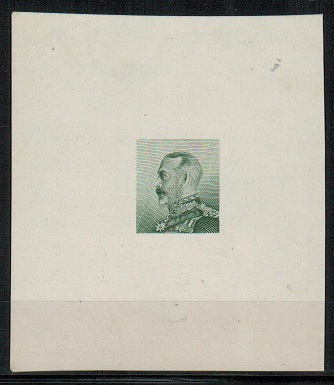 1935 (circa) 'King George V' head and sholders (in uniform) IMPERFORATE PLATE PROOF printed in green with engraved printing on white glazed paper (53x61mm). 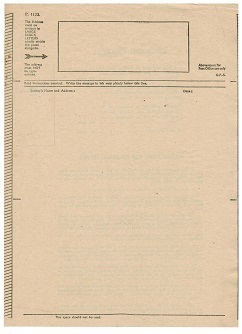 Produced by a Czech printer to show the quality of their work for British Commonwealth issues. Fine and scarce. 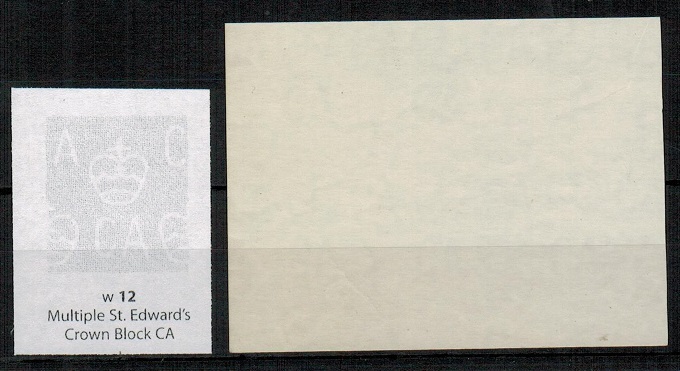 COLONIAL PROOFS/MISCELLANEAOUS - 1957 'ST EDWARDS' crown watermark gummed paper. 1957 (circa) printers gummed stamp paper (73x56mm) showing the multiple ST.EDWARDS crown block 'CA' watermark. Used for GB and Commonwealth issues. 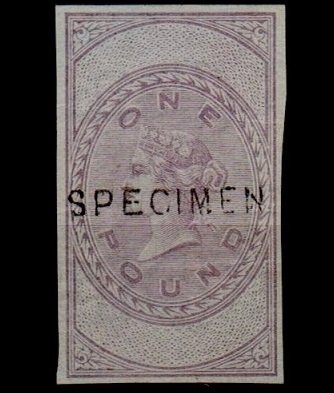 Very scarce as paper had to be accounted for. COLONIAL PROOFS - 1937 Waterlow and Sons 'KGVI' perforated ESSAY in red. 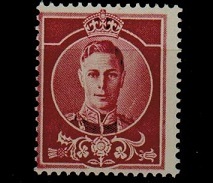 1937 circa 'KGVI' definitive ESSAY on unwatermarked perforated gummed paper in a superb unmounted mint printed in dark red and with no value expressed. Printed by Waterlow to demonstrate the 'Rotary Direct Plate Printing' machine. 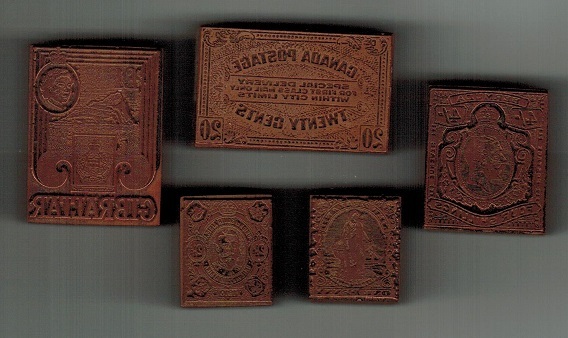 COLONIAL PROOFS/MISCELLANEOUS - 1960's copper/wood blocks used for printing album illustrations. 1960 (circa) range of five copper plates mounted on wooden blocks for the Bermuda GV 4/- 'key plate', Canadian 20c 'special delivery', Gibraltar QEII £1, New Zealand 1d 'universal' and South African 2 1/2d 'Union' stamp. 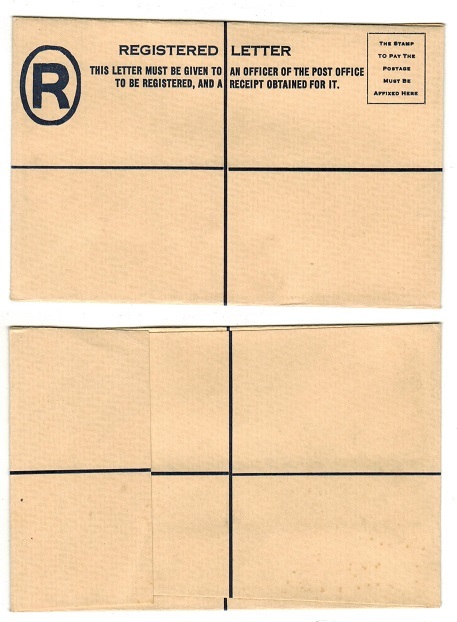 These five blocks were originally used in the printing of illustrations for stamp albums. An unusual lot of five. COLONIAL PROOFS AND MISCELLANEOUS - 1970'S FORMULA RPSE unused used in Atlantic Islands. 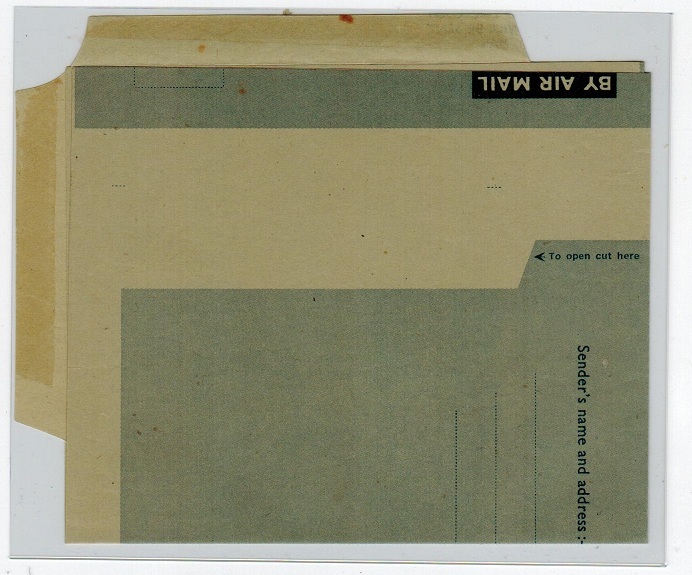 1970's circa dark blue on cream registered FORMULA postal stationery envelope (146x96mm) in unused condition with squared flap used in the Atlantic Islands of Ascension, St.Helena and Tristan Da Cunha. COLONIAL PROOFS AND MISCELLANEOUS - 1940-50 (circa) FORMULA (size H) RPSE unused. 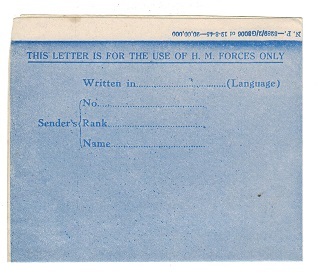 1940-50 circa blue on cream FORMULA registered stationery envelope (size H) in fine unused condition. 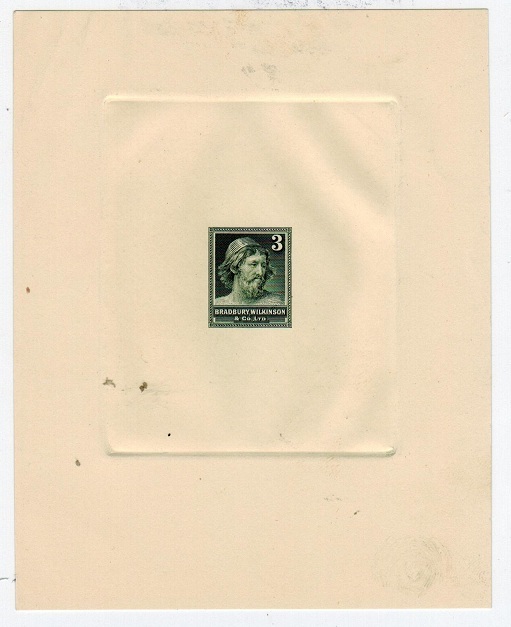 COLONIAL PROOFS - 1937 (circa) 'KGVI' IMPERFORATE PLATE PROOF without value expressed. 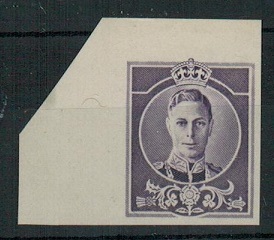 1937 (circa) 'KGVI' definative ESSAY printed in violet on unwatermarked IMPERFORATE gummed paper with no value expressed. Scarce. 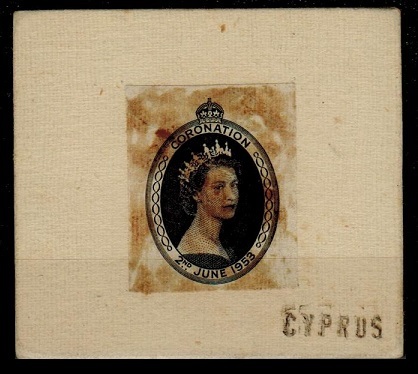 CYPRUS - 1953 'Coronation' IMPERFORATE VIGNETTE PROOF from official day book. 1953 Coronation issue (SG 172) IMPERFORATE CENTRE VIGNETTE PROOF printed in black on thin card affixed to day book and handstamped below "CYPRUS". The proof is largely covered with printers gum arabic type glue. A very scarce item. 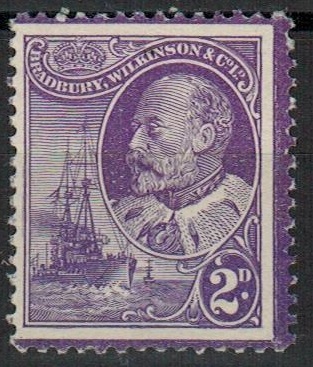 COLONIAL PROOFS/MISCELLANEOUS - 1900 'BRADBURY WILKINSON' 2d printers sample in violet. 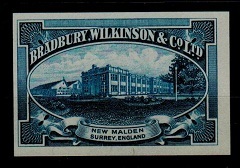 COLONIAL PROOFS/MISCELLANEOUS - 1900 'BRADBURY WILKINSON' 2d printers sample in turquoise. 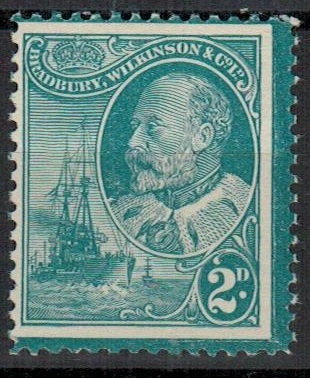 1910 circa 2d printers sample in turquoise on gummed perforated paper inscribed at top `Bradbury & Wilkinson Ltd' & depicting 'KEDWVII' as Prince of Wales in oval with naval destroyer at left. Fine & scarce. 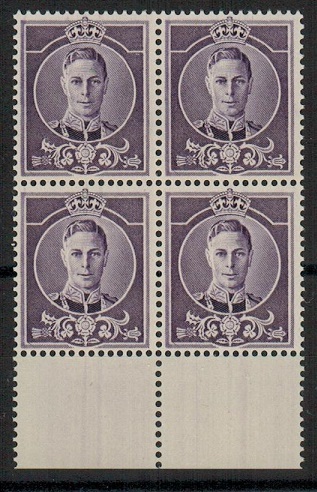 COLONIAL PROOFS - 1937 (circa) KGVI ESSAY block of four in violet without value expressed. 1937 circa 'KGVI' definitive ESSAY on unwatermarked perforated gummed paper in a superb unmounted mint bottom marginal block of four printed in violet & with no value expressed. COLONIAL PROOFS/MISCELLANEOUS - 1875 10c red ROYAL MAIL STEAMER PACKET COMPANY stamp. 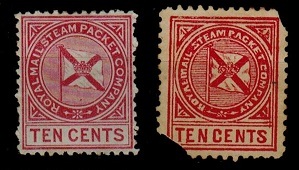 1875 10c Red 'ROYAL MAIL STEAMER PACKET COMPANY' perforated stamp in fine mint condition together with an interesting forgery having its top right and bottom left corners removed. COLONIAL PROOFS/MISC - 1940 (circa) 'P.1122' unused original airgraph. 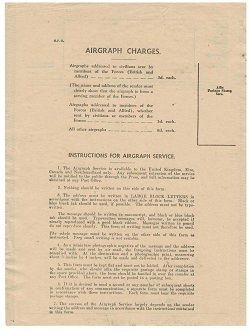 1940 circa original 'P.1122' air letter sheet in fine unused condition complete with airgraph charges and instructions on reverse. An unusual item. COLONIAL PROOFS/MISC - 1945 unused FORMULA 'Security think...' SSP Ltd airletter. 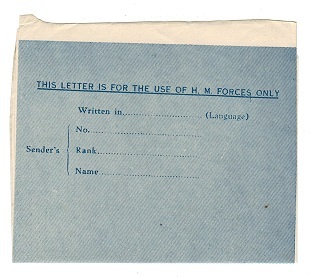 1945 dark blue on cream 'SECURITY-THINK BEFORE YOU WRITE' unused FORMULA air letter sheet with 'S.S.P.Ltd-P.O.No. 3289/2/G697-DT. 16.6.45-25,000' imprint in top margin. (I.A.F.F.-1083). Produced for military use. 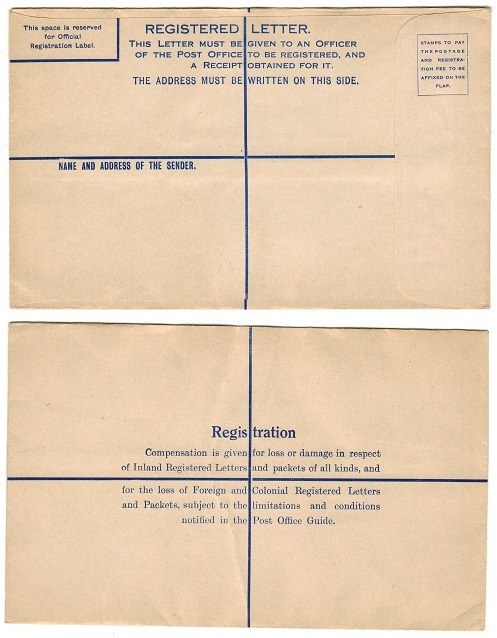 COLONIAL PROOFS/MISC - 1942 unused FORMULA 'Affix stamp here' airletter. 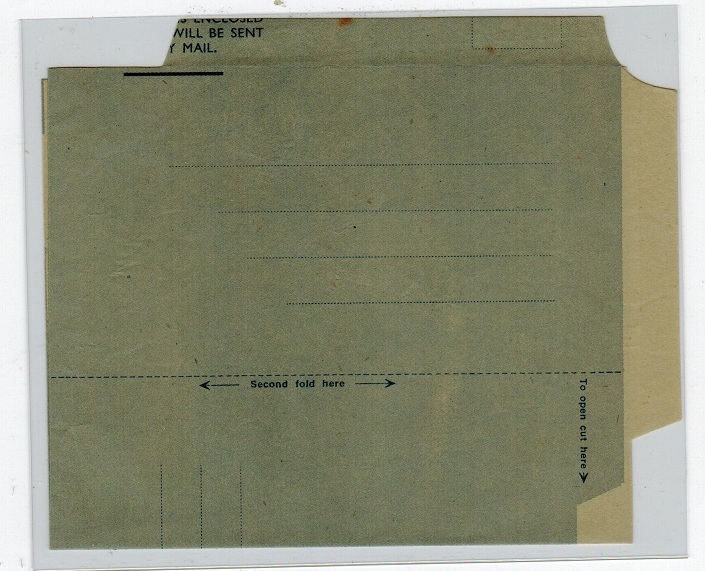 1942 (circa) AIR MAIL/LETTER CARD sheet in fine unused condition printed in blue on cream with square at left reading AFFIX/STAMP/HERE. 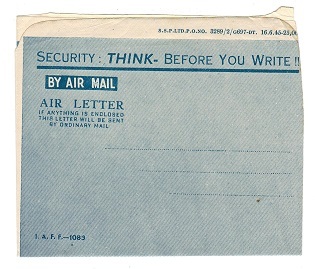 COLINIAL PROOFS/MISC - 1944 (circa) unused FORMULA 'Security-think before..' airletter. 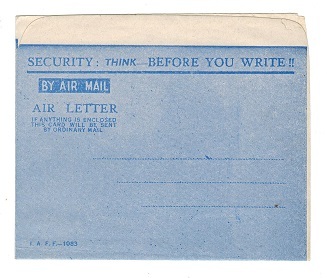 1944 (circa) bright blue on cream 'SECURITY-THINK BEFORE YOU WRITE' unused air letter sheet without imprint in top margin. (I.A.F.F.-1083). Produced for military use. COLONIAL PROOFS - 1955 'Centenary' DE LA RUE printers sample in a U/M block of four. 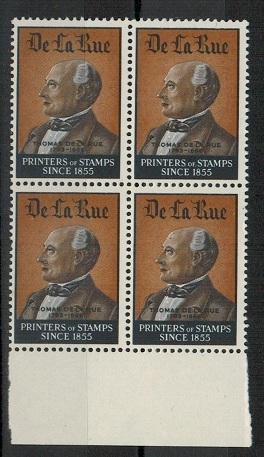 1955 'Centenary' of Printers Of Stamps Since 1855 - DE LA RUE sample block of four on perforated gummed paper depicting Thomas De La Rue. Odd tone spot on perf. COLONIAL PROOFS - 1950's (circa) THOMAS DE LA RUE blkx4 perforated PRINTERS SAMPLE in green. 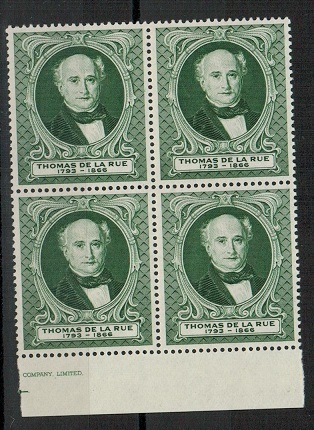 1950's (circa) THOMAS DE LA RUE printers essay 'sample' of Thomas De la Rue printed in green on perforated gummed paper in a fine top marginal block of four. COLONIAL PROOFS - 1940 (circa) FORMULA 'Air letter' sheet mint MISCUT ERROR. 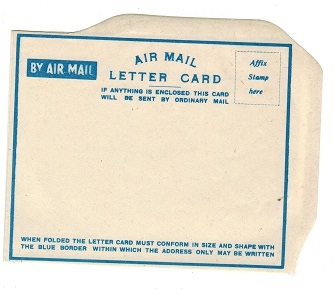 1940 (circa) FORMULA light blue on greyish BY AIR MAIL/AIR LETTER sheet in fine unused condition (with stamp square) showing the major error MISCUT OF SHEET resulting in the whole of the text being upwardly shifted some 35mm. A most unusual item for the air letter specialist. COLONIAL PROOFS - 1940 (circa) BRADBURY WILKINSON imperforate PRINTERS SAMPLE in blue. 1940 circa Bradbury Wilkinson & Co Ltd' PRINTERS SAMPLE printed in blue on imperforate gummed paper showing the building at New Malden, Surrey. Attractive item. COLONIAL PROOFS - 1950's (circa) THOMAS DE LA RUE blkx4 perforated PRINTERS SAMPLE in red. 1950's (circa) THOMAS DE LA RUE printers essay 'sample' of Thomas De la Rue printed in dull red on perforated gummed paper in a fine top marginal block of four. Odd toned perf. COLONIAL PROOFS - 1950 (circa) THOMAS DE LA RUE blkx4 perforated PRINTERS SAMPLE in blue. 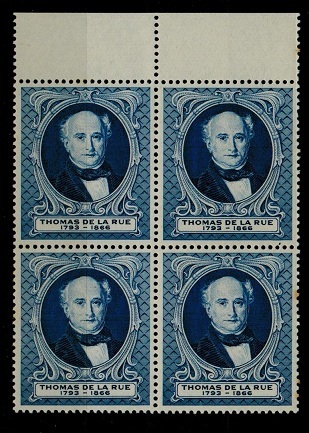 1950's (circa) THOMAS DE LA RUE printers essay 'sample' of Thomas De la Rue printed in dark blue on perforated gummed paper in a fine top marginal block of four. Odd tone perf. COLONIAL PROOFS - 1950 (circa) THOMAS DE LA RUE blkx4 perforated PRINTERS SAMPLE in black. 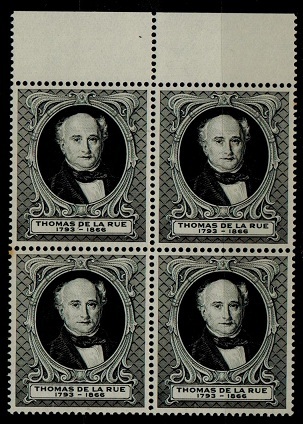 1950's (circa) THOMAS DE LA RUE printers essay 'sample' of Thomas De la Rue printed in black on perforated gummed paper in a fine top corner marginal block of four. Odd toned perf. COLONIAL PROOFS - 1955 'Centenary' PRINTERS SAMPLE blkx4 by Thomas De La Rue. 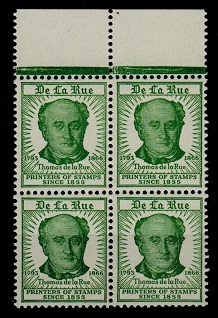 1955 'Centenary' De La Rue PRINTERS SAMPLE adhesive in a fine mint marginal block of four of the head of 'Thomas De La Rue' printed in green on perforated gummed paper enscribed 'DE LA RUE/PRINTERS OF STAMPS/SINCE 1855'. COLONIAL PROOFS - 1955 'Postage Centenary' THOMAS DE LA RUE printers essay. 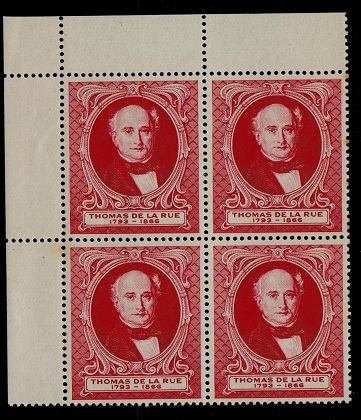 1955 'Thomas De La Rue' printers essay 'sample' headed 'POSTAGE STAMP CENTENARY/1855- 1955/THOMAS DE LA RUE LIMITED printed in red on gummed perfrated paper. One toned perf. COLONIAL PROOFS AND ESSAYS - 1956 (circa) Stanley Gibbons printers sample pair. 1956 circa vertical pair PRINTERS SAMPLE in violet on perforated gummed paper. 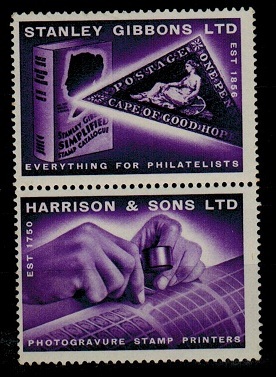 The top stamp enscribed STANLEY GIBBONS LTD the bottom stamp HARRISON & SONS LTD/ PHOTOGRAVURE STMAP PRINTERS. COLONIAL PROOFS AND ESSAYS - 1920 (circa) Bradbury Wilkinson (helmeted) Greek God proof. 1920 circa printers sample 'proof' inscribed 'Bradbury Wilkinson & Co Ltd' at top & helmeted Greek God in centre. Value tablets marked '4' & printed 'Specimen Stamp' at bottom. Printed in black on glazed card (86x127mm) & marked in pencil 5 diff surface blocks duplicate'. Fine & scarce piece of printers work. COLONIAL PROOFS AND ESSAYS - 1930 (circa) Bradbury Wilkinson head proof. Bradbury Wilkinson & Co. Ltd PROOF of an unissued head & '3' as value printed in grey- green on cream sunken card (100x127mm). Printed as a sample of their work. Fine & scarce.